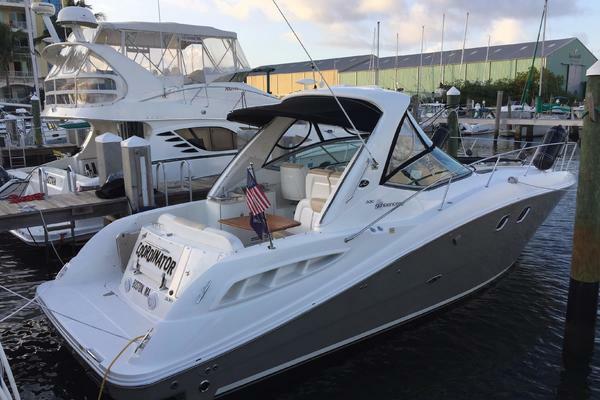 This 430 is an excellent example of Intrepid power boats tremendous craftsmanship fit and finish. This yacht will accommodate the avid fisherman as well as the most seasoned pleasure boaters. She has been stored indoors since new and has been captain maintained with an open checkbook. This is the nicest 43 Intrepid available today! The 430 Sport Yacht combines outboard power and Intrepid’s unique hull design to accommodate the needs and desires of serious fishermen, as well as pleasure boating passengers. A luxurious sense of space meets unmatched performance rarely found in boats of this size. The helm boasts commanding views and a pop-up console with the latest flat-screen electronics. Additional features include underwater lighting, icemaker, audio-video systems, air-conditioning, and power helm seating. Easily hit the islands for a week of diving and fishing aboard this boat. And the 430 Sport Yacht serves equally as well as a racy, big water dayboat for short hops, entertaining, or a casual day on the bay. This is pure boating pleasure…from the smooth, powerful ride to its state-of-the-art accommodations, the 430 Sport Yacht blends luxurious space, well thought out efficiency and peace of mind to create the best boat-owning experience on the water. Only Intrepid could give you a sport yacht that does so much so well. The helm features a spacious open design with an opening console revealing the electronics package. Custom adjustable Stidd helm seat for two at starboard. To port is a spacious L shaped seating with plenty of storage underneath. The 430 has a very spacious open cockpit with removable bench seat and a removable table. The 430 has a full anodized aluminum rail around the walk around with an anchor pulpit Lofranz windlass with added 200 feet of chain with foot controls and an easily accessed anchor storage for cleaning.